Sometimes a picture tells more than a thousand words - and videos are doing an even better job. 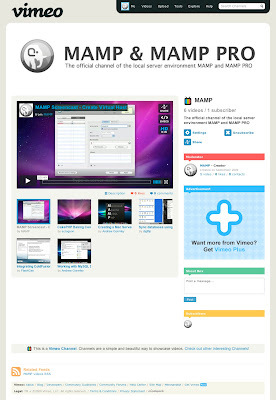 Lots of MAMP & MAMP PRO users have generated lots of screencasts showing off how to work with MAMP & MAMP PRO. So we thought it would be a good idea to start a MAMP & MAMP PRO Video Channel at Vimeo. Now you can find out how to set up virtual hosts, how to work with Cold Fusion, Wordpress, etc, or how to handle with databases. If you already made your own screencast about how to work with MAMP or MAMP PRO just upload it to vimeo and drop us a line in the comments so we can add it to our MAMP & MAMP PRO Channel. We promise to give you a mention and a backlink on our blog.